Specifies the cross-filtering direction to be used in a calculation for a relationship that exists between two columns. columnName1 The name of an existing column, using standard DAX syntax and fully qualified, that usually represents the many side of the relationship to be used; if the arguments are given in reverse order the function will swap them before using them. This argument cannot be an expression. columnName2 The name of an existing column, using standard DAX syntax and fully qualified, that usually represents the one side or lookup side of the relationship to be used; if the arguments are given in reverse order the function will swap them before using them. This argument cannot be an expression. one - Filters on the one or lookup side of the side of the relationship filter the many side. The function returns no value; the function only sets the cross-filtering direction for the indicated relationship, for the duration of the query. In the following model diagram, both DimProduct and DimDate have a single direction relationship with FactOnlineSales. 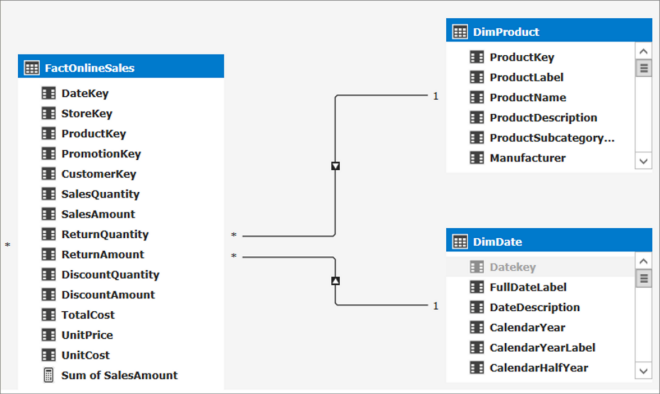 Turn on bi-directional cross-filtering on the relationship. This will change how filters work for all data between these two tables. Use the CROSSFILTER function to change how the relationships work for just this measure. By using the CROSSFILTER function in our measure expression, we get the expected results.